Clinical course, presentation profile, response to treatment of two patients who developed a toxic anterior segment syndrome (TASS) following uneventful phacoemulsification. Both the patients underwent slit-lamp examination and dilated fundus examination, in each follow-up and aggressive treatment with topical and systemic steroids. The white to white corneal edema and anterior chamber reaction subsided on follow-up at 1st and 2nd month, respectively, with improvement in vision. The report highlights key features such as relatively quiet eye on the first postoperative day with classical TASS picture seen on the fifth postoperative day and moderate recovery within a month necessitating a thorough examination of patients till the first week of surgery. Toxic anterior segment syndrome (TASS) is postoperative anterior segment inflammation. It usually develops after uncomplicated anterior segment surgery. Toxic agents associated with TASS include residue solutions used in sterilization, topical disinfectant, and preservatives in medicine used during surgery. Although cases of TASS have been reported following uneventful phacoemulsification, this case is unique in which the presentation has been a predominant corneal endotheliitis. We report two cases of TASS following uneventful phacoemulsification. 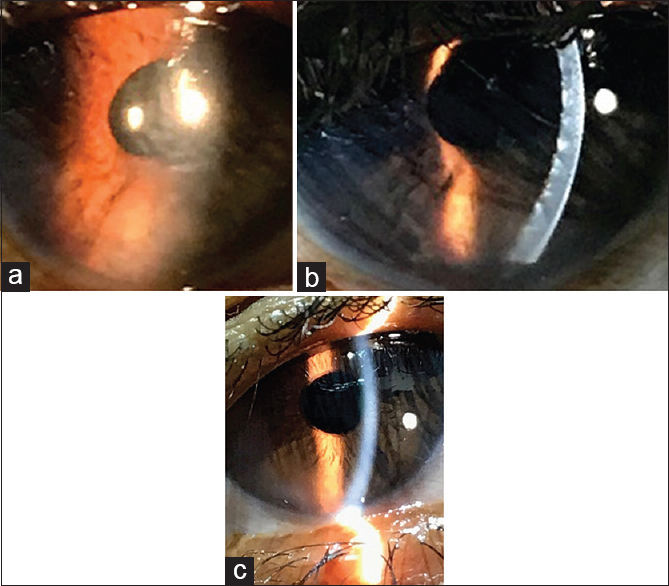 A 56-year-old patient, a type 2 diabetic with no retinopathy, underwent uneventful right eye phacoemulsification with implantation of hydrophobic intraocular lens. The postoperative examination on day 1 was normal with 6/6 vision with a clear cornea and quiet eye. He presented on the 5th postoperative day with blurred vision. The vision was 2/60 with a white eye and limbus to limbus corneal edema [Figure 1]a. Anterior chamber reaction was present with cells 2+ and flare 2+ with pigment dispersion. Good fundal glow was present with corneal edema precluding the view of the fundus. The B-scan was normal with a clear vitreous and normal retinochoroid scleral thickness complex. The patient was immediately started on topical steroids and hyperosmotic agents. The corneal edema receded gradually over a period of 3 weeks. By 1 month, the patient had a vision of 6/12 with few Descemet's membrane (DM) folds, pigments on the endothelium and a clear view of the fundus with minimal anterior chamber reaction [Figure 1]b and [Figure 1]c.
A 62-year-old patient underwent uneventful right eye phacoemulsification with implantation of a hydrophobic intraocular lens. The postoperative picture on day 1 showed minimal corneal epithelial edema with anterior chamber reaction of 1+ cells and flare 1+ with a vision of 6/9. The patient presented on the 5th postoperative day with defective vision of 1/60 [Figure 2]a. There was a white to white corneal edema with anterior chamber reaction of 3+ cells and flare 3+. The B-scan was normal with a clear vitreous and normal retinochoroid scleral thickness complex thickness. The patient was started on topical and systemic steroids. By postoperative 3rd week, the vision was RE6/60. The corneal edema had decreased with DM folds, fundus was normal. By postoperative 6 weeks, the cornea was clear with a vision of 6/12 [Figure 2]b and [Figure 1]c.
These two cases highlights the prompt early detection of TASS and the relatively mild symptoms of TASS on the 1st postoperative day with a classical TASS-like presentation on the 5th postoperative day. There was a marked response to steroid in both the cases over a period of 1 month. The theater fluids and sterility check were done for all ocular medications which was normal. Both the eyes were done on separate days. Both eyes received intracameral application of preservative-free moxifloxacin at the end of surgery. TASS is postoperative anterior segment inflammation. It usually develops after uncomplicated anterior segment surgery. Toxic agents associated with TASS include residue solutions used in sterilization,, topical disinfectant, and preservatives in medicine used during surgery. The presentation in the two patients was corneal edema noticed in the 2nd postoperative visit with a normal-appearing cornea in the 1st postoperative day. This was a toxic endotheliitis noticed beyond the 1st postoperative day. Diffuse corneal edema is usually seen in TASS. Anterior segment reaction with progressive cell, flare, and hypopyon formation and fibrin reaction are also observed. Secondary glaucoma due to iris and trabecular meshwork damage may be seen. Visual outcome changes from 20/20 to no light perception. TASS may be seen as sporadic cases or in outbreaks. A study describes an outbreak of TASS that appeared after uneventful cataract surgery, possibly due to intracameral use of 1 mg/0.1 cc cefuroxime. Outbreaks associated with sterilization methods and endotoxin contamination of balanced salt solution have been reported.,, The use of moxifloxacin has been reported with use of TASS.,, In our two cases of TASS, preservative-free moxifloxacin was used. None of the other cases done on the same day showed evidence of inflammation. The probable etiology, in this case, is a toxic endotheliitis presenting with corneal edema noticed beyond the 2nd day. The inflammation subsided over a period of 1 month. These two cases highlights the fact that a TASS presenting as endotheliitis can make its appearance after the 1st postoperative day, necessitating careful examination of patients till the 1st postoperative week. TASS can make its presence even beyond the 1st postoperative day, necessitating thorough examination of patients till the 1st week. Sorkin N, Varssano D. Toxic anterior segment syndrome following a triple descemet's stripping automated endothelial keratoplasty procedure. Case Rep Ophthalmol 2012;3:406-9.
van Philips LA. 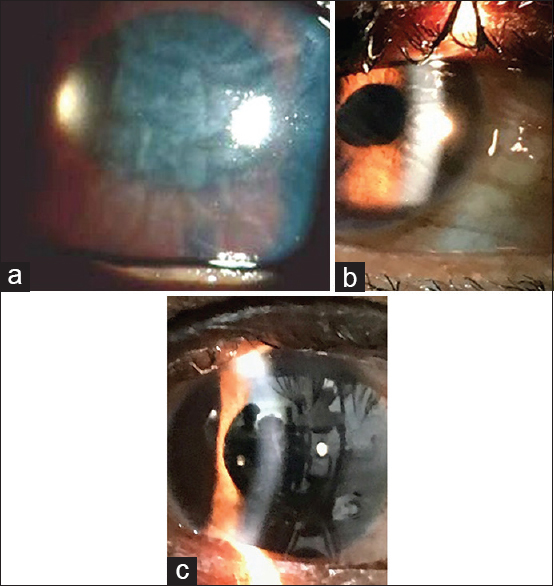 Toxic anterior segment syndrome after foldable artiflex iris-fixated phakic intraocular lens implantation. J Ophthalmol 2011;2011:982410. Sato T, Emi K, Ikeda T, Bando H, Sato S, Morita S, et al. Severe intraocular inflammation after intravitreal injection of bevacizumab. Ophthalmology 2010;117:512-6, 516.e1-2. Cutler Peck CM, Brubaker J, Clouser S, Danford C, Edelhauser HE, Mamalis N, et al. Toxic anterior segment syndrome: Common causes. J Cataract Refract Surg 2010;36:1073-80. Sarobe Carricas M, Segrelles Bellmunt G, Jiménez Lasanta L, Iruin Sanz A. Toxic anterior segment syndrome (TASS): Studying an outbreak. Farm Hosp 2008;32:339-43. Kutty PK, Forster TS, Wood-Koob C, Thayer N, Nelson RB, Berke SJ, et al. Multistate outbreak of toxic anterior segment syndrome, 2005. J Cataract Refract Surg 2008;34:585-90. Unal M, Yücel I, Akar Y, Oner A, Altin M. Outbreak of toxic anterior segment syndrome associated with glutaraldehyde after cataract surgery. J Cataract Refract Surg 2006;32:1696-701. Hellinger WC, Hasan SA, Bacalis LP, Thornblom DM, Beckmann SC, Blackmore C, et al. Outbreak of toxic anterior segment syndrome following cataract surgery associated with impurities in autoclave steam moisture. Infect Control Hosp Epidemiol 2006;27:294-8. Espiritu CR, Caparas VL, Bolinao JG. Safety of prophylactic intracameral moxifloxacin 0.5% ophthalmic solution in cataract surgery patients. J Cataract Refract Surg 2007;33:63-8.